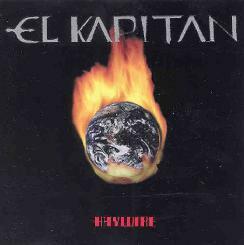 El Kapitan is a hard-driving industrial metal band with a bit of a techno edge. From New Hampshire, they are the two-man outfit of Kirk Bartholomew on guitars, bass, and vocals, and Marc Soucy on keyboards, samplers, and programming. The music rocks VERY hard and struck me as sounding like Chrome as a more keyboard based band if that's any kind of analogy. Most of the tracks on this ten song CD feature a trademark El Kapitan metallic sound. "Rainforest Serenade" opens the disc with its rough techno beat, freaky sounds, and wild vocals. An almost stoner-sounding guitar provides the melody. "The Wild Ride" is a perfect title for the next song. This tune rocks hard. Keyboards join the buzzsaw guitar for a very interesting mix bringing the band a bit into heavy progressive territory. The song has a cool jam section too as guitar, bass, and keys trade off licks. Parts of this made me think of ELP as a metal band. My favorite track on the disc. "El Capitan", "Snowrider", and "Hey Y.R.U." are other heavy duty rockers that feature the band's penchant for near dancable metal. "Jekyll To Hyde" is an interesting tune with its techno, rappin', organ melody, buzzsaw guitar blazin' rock mixture. And "Pay Me" is the most overtly techno track on the disc, though it includes lots of freaky sounds and, of course, metal guitar to keep the whole thing rockin'. "Trail Of Tears" and "Mysteria" stray quite a bit from the standard El Kapitan sound being far more laid back and unlike the other tunes. "Trail Of Tears" is actually reminiscent of older Pink Floyd and has a nice David Gilmour sound to the guitar soloing. "Kittinkabootal" is really different being an off kilter track that sounds like a carnival styled country hoedown. The Dixie Dregs on acid? Dig that barn dancin' violin sound. A good effort that will appeal to metal heads willing to venture into different, and sometimes dancable, territory. You can email El Kapitan at ELKAPITAN1@prodigy.net.